As you may or may not know, in addition to all of my pattern designing and book writing, I also do a lot of freelance writing for Crochet Today. One of my favorite projects (and the one I’m procrastinating on at the moment) is gathering up products for their “We Love” page. I’m constantly on the lookout for cool crochet-related things on the web, at the yarn shop, and on etsy. [Side note: If you make or sell some of these things, please, feel free to email me!] One of the “downsides” to this assignment, and I say that laughably, is half of the time I end up buying the things I find, whether they make the final cut or not. While I was doing a search recently, I came across some gorgeous yarn bowls by Darrielle’s Clay Art on Etsy. What is a yarn bowl, you ask? It’s a bowl made especially for holding yarn. Most of them have a hole that you can thread the yarn through, so that if your yarn ball gets to rolling around, it can do so like a graceful ballerina in the bowl, instead of like a tasmanian yarn dust devil on your floor. 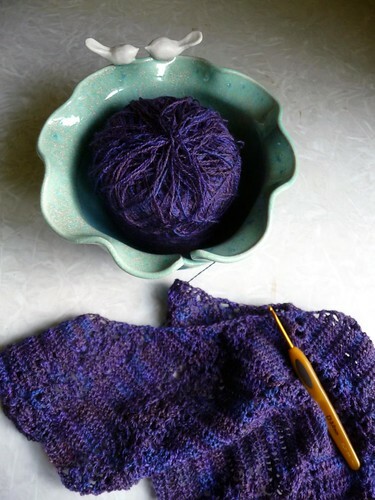 Good bowls also have a hook shaped groove that you can thread the yarn through, so that should you want to leave the house with your project (but not the bowl)–or should you want to switch projects–you can easily remove the yarn. I have been wanting to own a yarn bowl for a while, but what can I say, I’m particular. Because I’ve made pottery and because I know so many potters, I want what I want how I want it, and I’m willing to wait. But when I stumbled upon this yarn bowl, I knew that resistance was futile. Look at the lovely wavy edge! And the gorgeous icy mint/turquoise glaze! And the cute white birdies at the top! I watched it for a week or so, trying to be good, but I couldn’t help myself. In person, it’s even better than I imagined. I’ve thrown some pots in my day, so I know what goes into a finely crafted specimen (personally, I’m not there yet!). The sides are thin and smooth (not clunky) and the smoothness of the cut yarn groove and hole are equal to anything mass-produced. I also love the contrast of the hand-formed porcelain birds, which are not as polished as the rest of the bowl–they remind me that someone made this with their two hands. As a person who tries to make my living creatively, I feel it’s important to support other creative businesses, so there was no guilt with this purchase! 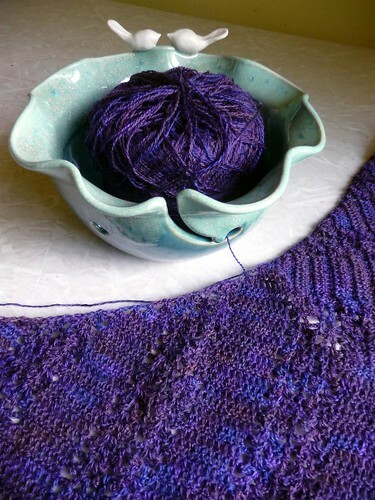 Once I received the bowl, my Garden Path Shawl jumped right into it. The yarn that I am using, Mountain Colors Winter Lace –made just a few hours away from where I once lived– got a little crazy while I was winding it, so I couldn’t pull it from the center. (One day I will write a book entitled “Zen and the Art of Yarn Winding”.) I know this bowl will be just the thing to tame it. If you’re in the market for a yarn bowl, or even just some pretty pottery, I highly recommend Darielle’s Clay Art. I am not receiving any compensation to say so, just trying to help another creative person. And now, I guess I have to get back to my writing! Oh yes! I saw that in etsy a while ago and tempted to buy one myself. However, thinking that I have 2 toddlers around me, probably not a good idea to buy at this moment. Plus just imagine how much shipping cost I have to pay. Sweet! I've seen those...in fact, I may have favorited this gal, but well...I favorite a lot of things and so I don't want to have to look through pages and pages to see if it was her! :) Maybe I should sort through those! Never never before had I heard of a yarn bowl - and now I want one!